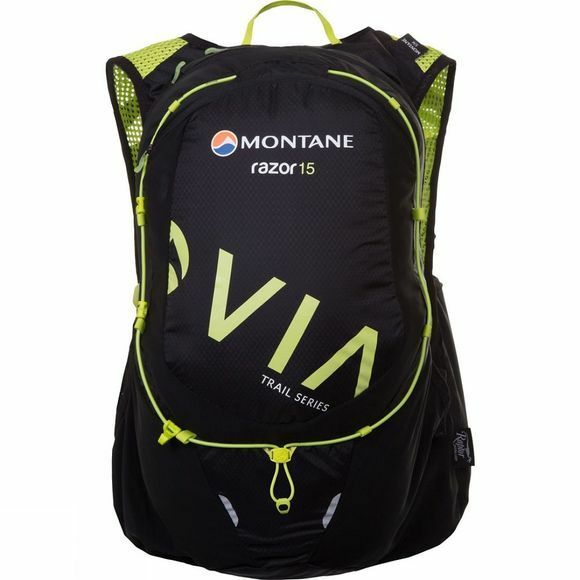 The Montane Via Razor 15 Rucksack is designed for speed on the trail and in the mountains. The pack uses the proven Montane Freelight Chassis with its stretch body fit to provide an unrivalled weight balance, allowing you to wear, rather than carry your kit when moving fast over rough terrain. It's 15-litre capacity provides optimal volume for carrying essential gear on longer trail missions and during ultra events. The packincorporates compression together with larger stretch mesh side pockets, making this one of our most versatile ultra distance trail running packs. Raptor UL fabric has an great strength to weight ratio through the use of Robic filaments, while Montane's Freelight Chassis constructed from lightweight Contact Flyte Mesh is fast drying and highly breathable. Bound seams on the chassis give stronger, soft touch neater edges. 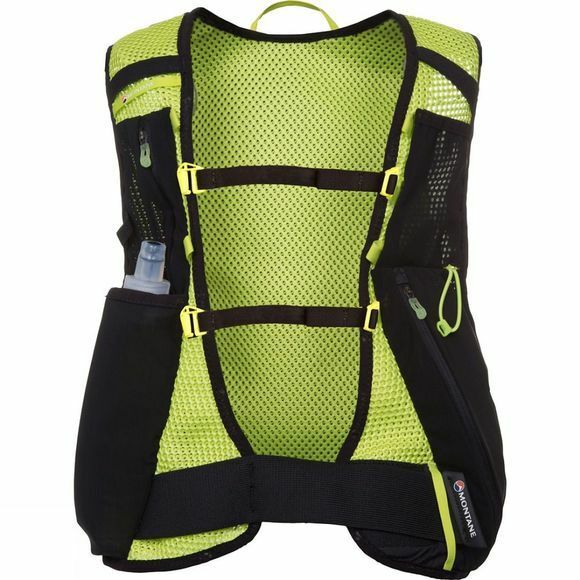 The front stretch hook and loop lower body adjustment enables the chassis to grip your body while running and allows unrestricted breathing during exertion. Elastication also allows your rib cage to expand freely for unrestricted breathing during exertion. Two Montane SoftFlasks aloow fast, compressible hydration while on the move. They can be compacted when empty for neat space saving. There is also an internal hydration bladder attachment point in attachment points for the the tube on the chassis. An external bungee system doubles up as effective compression allowing the pack to be cinched down with low profile penny cordlock adjustment. A pole attachment point that is easy to access while on the move.